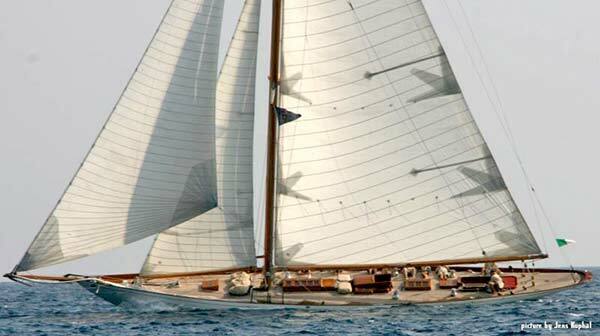 The 24.7m cutter Hallowe'en was designed by William Fife III for Lt Col JFN Baxendale in 1926 and built to the 15m rule. When William Fife received the order to design the Hallowe'en, he decided to rig the yacht as a low-aspect ration bermudan cutter which was uncommon in the days when gaff rigged racers dominated the various regattas. These experiments with her rig continued over the following years as her mast and boom heights changed and eventually she was transformed to a yawl. William Fife III, who was the designer of a number of classic yachts still racing today, was quoted once as saying "Hallowe'en is the perfect gentleman's yacht. She is a jewel". 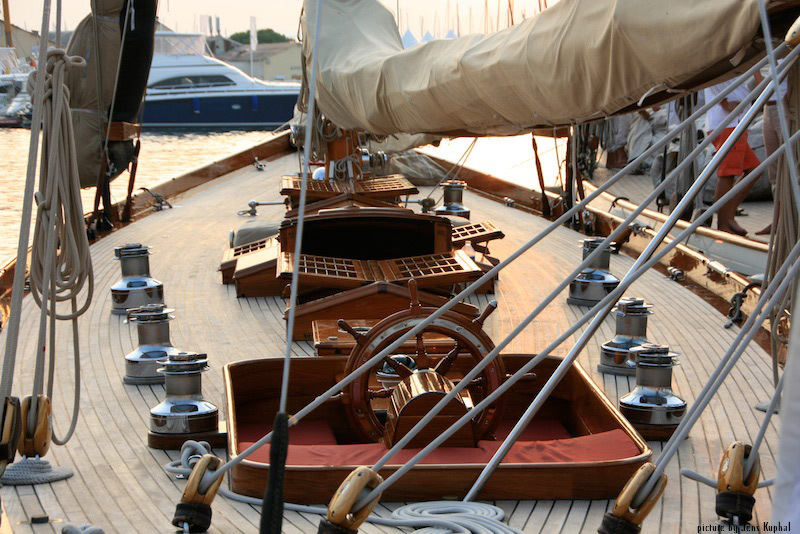 The authentic beauty of the famous yacht will take you back in time to 1926. 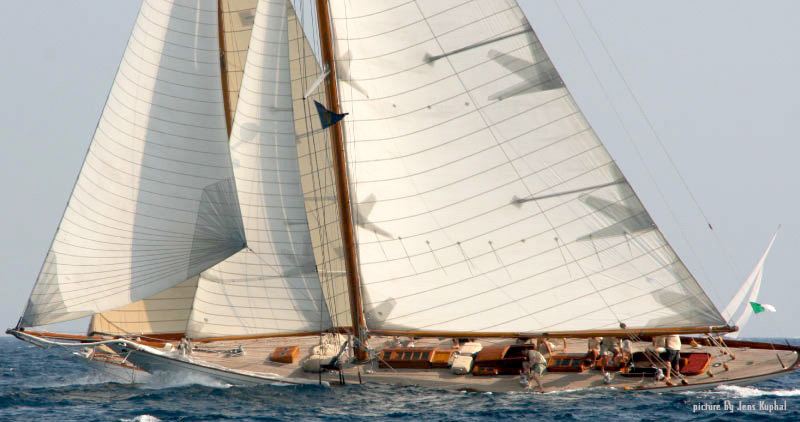 Complete with her original mahogany interior, Hallowe’en is one of the finest vintage racing yachts on the Mediterranean circuit. The construction of Hallowe'en was completed and the cutter was launched in 1926 just in time to compete in the ORC FastNet. Racing in the 2nd Fastnet Race, Hallowe'en sailed the fleet home to cross the line some 10 hours before the next competitor. A record which would stand until 1939 when the new course was shortened, going out through the Needles Channel instead of heading around the east coast of the Isle of Wight, as had been the course since 1925. After racing in the Mediterranean for a number of years she returned to the Atlantic under new owner Alfred Larsen, a Norwegian industrialist. She became the Royal Norwegian Racing Clubs official yacht and was helmed numerous times by future king to Norway, Prince Olaf. In 1938 she ventured across the Atlantic and then disappeared off the radar. 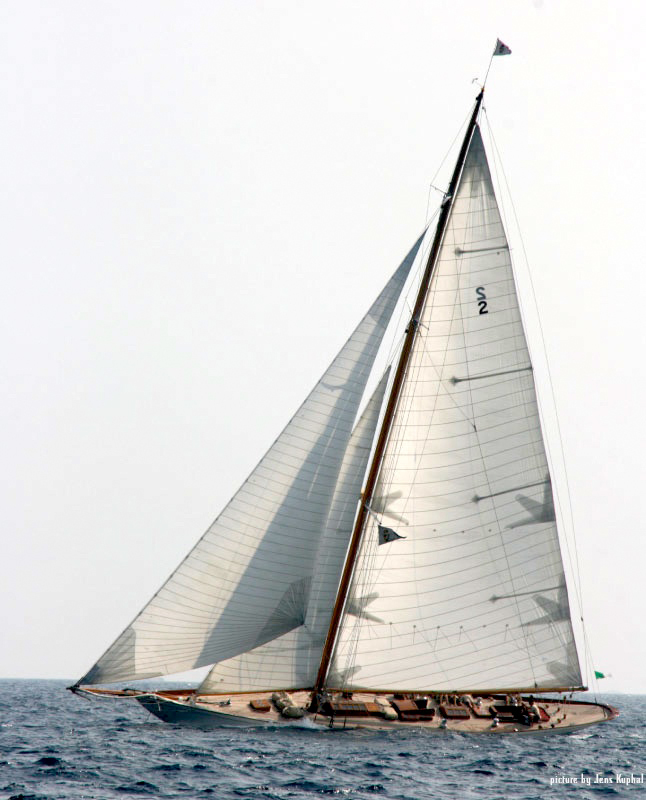 She was later discovered by Walter Wheeler and renamed Cotton Blosson IV before continuing her history of ocean racing and eventually being donated to the Classic Boat Museum at New Port, Rhode Island where she waited for a much needed refit. After 5 years of work in New Port, funds dried up and Hallowe'en was in need of new ownership and she eventually returned to the Mediterranean when Elizabeth Meyer (owner of J-Class Endeavour) helped find a buyer. 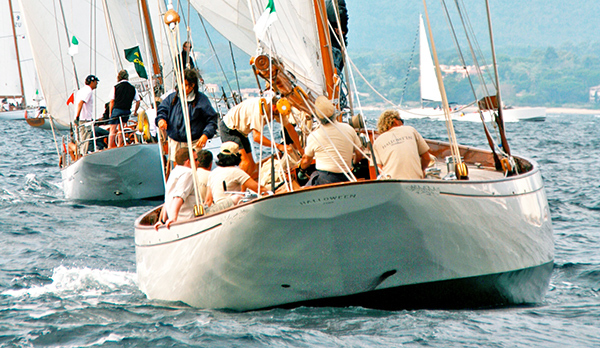 She has had a number of refits (and owners) since then, the latest being completed in 2009 at Fairlie Restorations on the Hamble river, UK, and is now available for charter in the Mediterranean where she races competitively in the classic regatta circuit which stretches from France to Corsica, Spain and Italy. 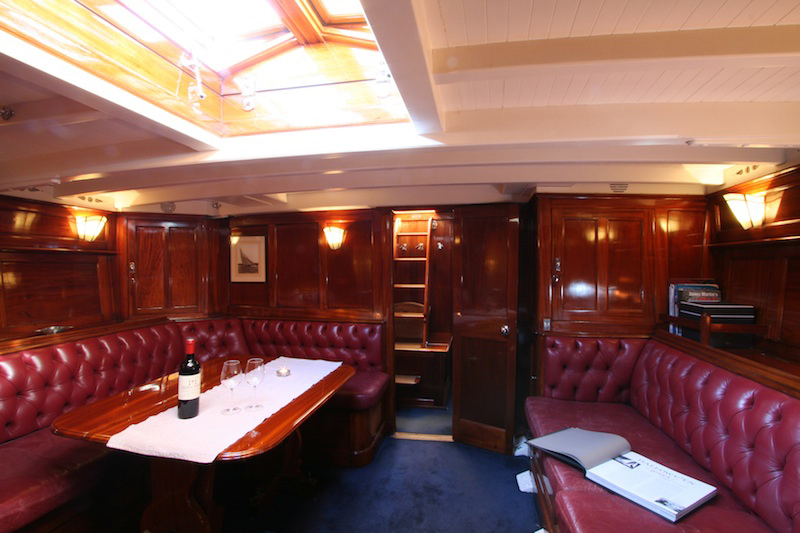 Hallowe'en is available for classic regattas (Trophée Panerai, Nice, Antibes , Régates Royales de Cannes, Palma Classic, Mahon Classic, les Voiles de Saint Tropez) and day charter with up to 12 people. Interested in Classic Yacht Halloween? 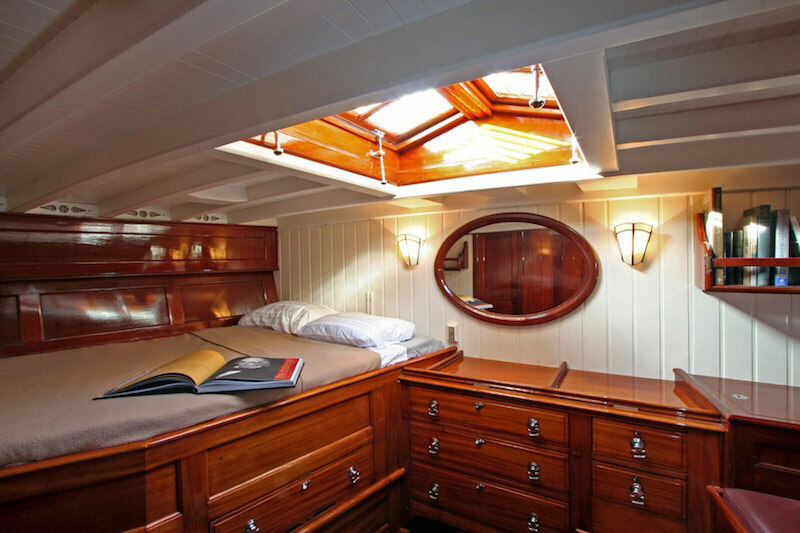 Copyright © 2019 iSails classic yacht charter crewed charter mediterranean sea caribbean. All Rights Reserved.